Eugene Edgar Eaton was born in Rochester, VT., June 23, 1843. He was educated in the public schools and academies in the vicinity of his native town. He studied law, graduating from Harvard Law School in 1868, and was admitted to the bar in Rutland, Vt., in the same year. He was in the office of Col. W. G. Veazey, and assisted him as Supreme Court reporter, and after a brief practice in Kansas and Colorado, removed to Massachusetts in 1878. He opened an office in Boston and made his residence in Malden, where he was a member of the Board of Aldermen in 1892 and 1893. He was married in 1871 to Loriette Avery, of Wakefield, Mass. and has no children. He had the good fortune to serve as First Sergeant of his brother's company, A, Sixteenth Vermont Volunteers, which was one of the regiments of Stannard's brigade that made the famous flank movement against Picket's column in the repulse of Longstreet's assault at Gettysburg, July 3, 1863. Near the close of that encounter he was fearfully wounded, a shell tearing out a portion of his neck and shoulder. But he clung to his rifle, approached his Colonel and saluted, and modestly asked permission to go to the rear. "You shall have it, my brave fellow," replied Colonel Veazey (who when he was Commander in Chief of the GAR related the event to Col. Albert Clarke, who has contributed this sketch) "and if you are not able to go alone I will send a man with you." But the plucky sergeant thought he could go alone and he went, until he fell from loss of blood and was picked up by an ambulance. He and the captain were taken to the same hospital and were before long watched over and attended by their father, who had come on from Illinois. He did not recover in time to re-enter the served (sic), and so resumed his studies." 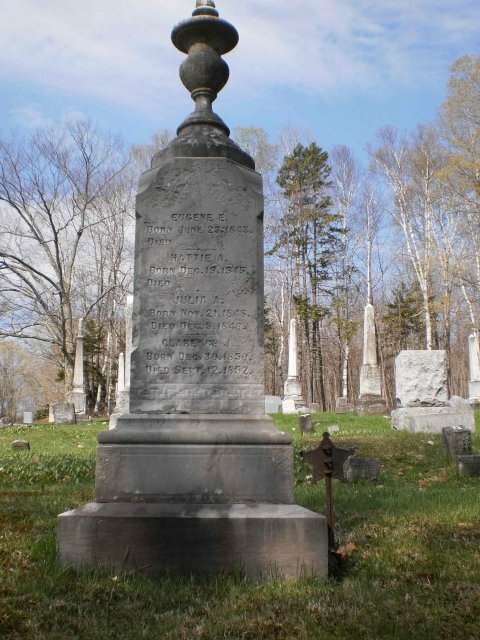 Although Eugene Edgar Eaton presumably died in Malden, Mass., and his brother Henry Augustus Eaton was buried on the battlefield, both are named on the Eaton family monument in North Hollow Cemetery in Rochester, Vt.
See also, biographical sketch on Henry Augustus Eaton.